First of all allow me to say that Point Blank is an amazing program, with very accurate results, and most of all, it is free to everyone. I do appreciate the efforts of Dallan who is keeping the program running and up to date, and this is an indication of a man who loves what he is doing. Therefore, I would like to say a big Thank You to Dallan for his efforts. The reason for writing this post, is that it seems that I cannot find anywhere a way to adjust the scale of the vertical axis (X-axis) in either any of the ballistic graphical format views. I faced with a problem that if I wanted to see the graphical view of a load where the elevation of the bullet was significant, there was no trajectory curved displayed due to curve exceeding the displayed elevation. This happened very often to my laptop's 14" screen. So either I had to see the graph to an external 24" screen, where due to much higher resolution, the whole graph was displayed, or I had to put a closer zero distance, in order the bullet elevation to be lower. Therefore, I kindly ask Dallan to either consider a modification so the user will have the availability to alter the scale of the vertical axis (Y-axis) of the graphs, as he has with the X-axis which is the distance, or modify the program so that automatically display the scale of the vertical axis according to the lowest and highest value, and logical intervals in between. 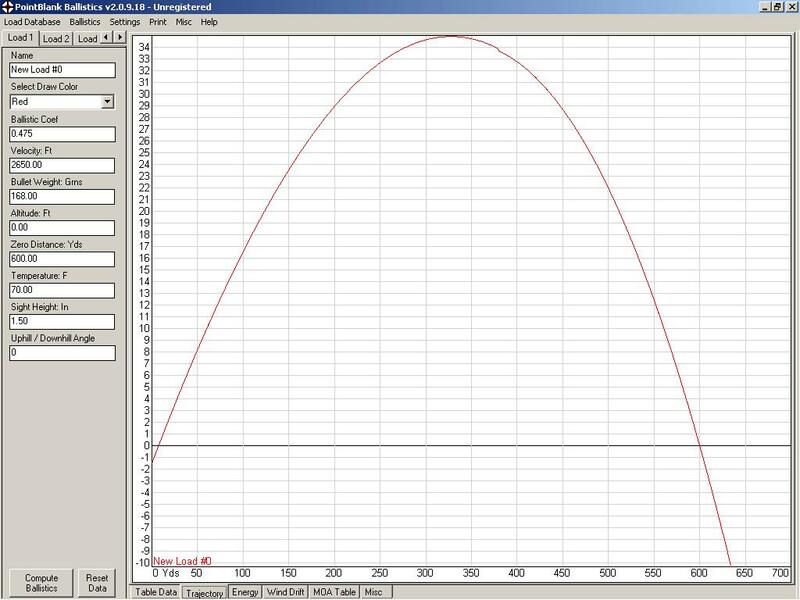 The trajectory curve is from -1.5" up to 52.2", however, in my laptop's screen, what is displayed is from 8" up to 52", and no curve at all, or even part of the curve. Also, the vertical axis (Y-axis) has a scale (interval) of 1", which for such a large elevation, I assume it is not necessary. An interval of 2" or 4" or even 5" I think would be better, minimizing the graph size. I assume that a different interval would allow for the curve to be displayed properly. When I changed the Zero Distance to 650 yds, leaving all the other parameters exactly same, the graph was displayed. Please Dallan, make your magic and give us the ability to adjust the Vertical (Y-axis) scale, as you allow it to happen in the Horizontal (X-axis) with the distance. Apart from the above request (or bug?) there are some other points I would like to indicate, but I will wait for your kind reply first. Thank you very much, I am looking forward for your soonest reply. Welcome Adis, and, on behalf of Dallan thank you for your kind words. Dallan is a busy man, but he checks these pages regularly, so he will be along shortly. He usually tries to replicate the problem before offering or suggesting a solution, so if it seems he is a little slow, that will be the reason. Dallan, is there anything in the works to make PB available for iPhone and Android mate? Thank you very much Vince for your welcome words. There is no problem in waiting. Considering that it is absolute a free program, we should be thankful to Dallan for his effort and his private time. Just to add, that in case there is of help, I attach the following screenshots, in order to have a better understanding of the problem. I am getting some free time and will take a look into this. I dont think it should be a big deal to add scaling... other than figuring out where to put the scaling menu option. As for Android / iPhone versions, I had to put that on hold due to work... then my trial version of the development software expired. I'll have to see if I cant get a new trial, or pony up the $500 for a 1 year license (I didnt think due to work I could get it done before the trial expired hence my not taking it further). I will revisit the mobile versions after I take care of a laundry list of bugs for PointBlank as well as finish up the ability to store the users database on huntingnut automatically (useful so you can get at your data from any computer, as well as hopefully give another level of data backup protection). Also, and most importantly THANK YOU for including screen shots with the data you use, it is invaluable to reproduce the problem issues and get a fix made. Please, please, take your time!!!!!! You have all the time you want. What you are doing here is a favour to all of us by providing one of the best software available and for free. So it would be at least disrespectful to you and your efforts if we "request" to solve our problems the soonest possible. Regarding the screen shots, I have more of them with different loads if you want, and I can upload. Just let me know. As I said, if I see the same load and Zero Distance in my larger external screen (24" Vs 14" of my laptop), then the curve is showing with no problems. HOWEVER, the same thing applies if I try to see the curve having a Zero Distance of 1000 yds (you know the 1000 yds shot) even to my 24" screen. Then, due to the high elevation of the projectile, no curve is displayed. Of course, please allow me to help here by saying that everything depends on the screen resolution. If I have my 24" screen to 1400x1050 resolution, then I cannot see the trajectory curve of the .308" load with Zero Distance @ 1000yds. By increasing the resolution to 1600x1200 or 1900x1200, then I can see it. But this is not the point, I guess. Cause many times we need to watch the curves in a smaller screen and in much smaller resolutions than 1600x1200. Therefore, I do believe that the availability to provide the user with the option to adjust the scale of the vertical axis, would be quite valuable and handy. By the way, is there any chance to ask for another two or three improvements Dallan? I do believe they are relatively easy to implement, and will improve the overall performance, or shall I say, user friendliness of the software. If you give me the go ahead, I will write them in this post. If not, no problem!!! BUT why would you want a zero distance of 700m to 1,000m? There are a lot of long range target shooters who would no doubt find this valuable Tiks. No use to me mate...I can't see that far even with binos mate. ...As for Android / iPhone versions, I had to put that on hold due to work... then my trial version of the development software expired. I'll have to see if I cant get a new trial, or pony up the $500 for a 1 year license (I didnt think due to work I could get it done before the trial expired hence my not taking it further). No problems mate...not a war winner. It will happen, when it happens, if it happens. If I was still working I would pay the license for you mate...you have certainly earned that. Yes, you got a point here. However my interest is on long range shooting, and therefore I want to perform some calculations in distances well over 500 yds or meters. Plus, I have the same problems regarding display of the trajectory curve when I use the .50" BMG caliber for ranges over 800 or 900 yds. And of course such a caliber, as well as .338" Lapua, or .408" Cheytac, are supposed to be used for long range shooting. I guess similar things apply for the 6mm calibers such as 6PPC, 6mmBR, .243" Win, 6.5-284, etc. for long range shooting (1000 yds competition). Finally, there are some capable shooters who can exploit the .308" Win to its full potential, and that is beyond 700 yards. Obviously, I am not implying that I am such a shooter. On the contrary. I am just interested in looking the ballistics and learn as much as I can from them. I hope the above explain the reason I am looking for long range shooting almost irrelevant of caliber. Plus, I believe that my comments allow for an improvement of the software, allowing to be more flexible and also more user friendly. Please see the trajectory curve and notice how disproportional looks in comparison with the distance. Even if the distance is down to 400 yds, which is relatively normal for a .308" load, the curve looks extremely disproportional to the distance axis. A scale of 5" elevation instead of 1" as is now, or even better to allow the user to adjust the scale of the Vertical Axis, as you do in the Horizontal Axis would create a much more natural, good looking and proportional curve. Can we modify the bullets.slk so that to have the Vo (muzzle velocity) in the data? Of course this will be a representative (average) one, and not an actual one. I put some velocities in the bullets.slk file, however when I choose the specific bullet which have the velocity (in the last column next to BC & SD), this velocity is not input automatically. Is it something we can implement or needs some adjustment of the software from your side? Because the velocity is dependent on all the other components and the individual firearm you can only place the velocity in the load data. If you placed it with the bullet you won't get accurate results. You will have to measure your velocity with a chronograph to get a value to use. Otherwise you don't have any idea what the speed, and the trajectory, will be for any given load. I dont have plans to add a velocity field, simply because I think it will confuse more people than not. Velocity is completely dependent on your firearm and load. Some people shoot rifle calibers out of pistols, some people shoot pistol bullets out of muzzle-loaders. It would be a mess. As for the trajectory view, the program tries to fit things based on the peak of the trajectory and the # of inches of drop, and a preset internal value of how "high" on the screen 1" is. This obviously needs to adapt when dealing with super long trajectories that have really high arc's. Thank you for your reply. Regarding the velocity, I can understand clearly your point as well as Paul's so there is no problem at all. As for the trajectory view, do you think that you can add this adjustment for the vertical (Y) axis (scaling) as per my request in a new upgrade of the software, or you consider it as a no need to be feature? Personally, for the way I use the program, I find it quite important since I "play" with long distances. The availability of adjustment in the vertical (Y) axis (scaling), will allow me to see the trajectory without the need to take the data and import them in the excel and draw a new curve. Even if this curve is shown in a small screen with relatively low resolution. Thank you very much in advance, and I sincerely do hope to a positive reply whenever you have free time of course. 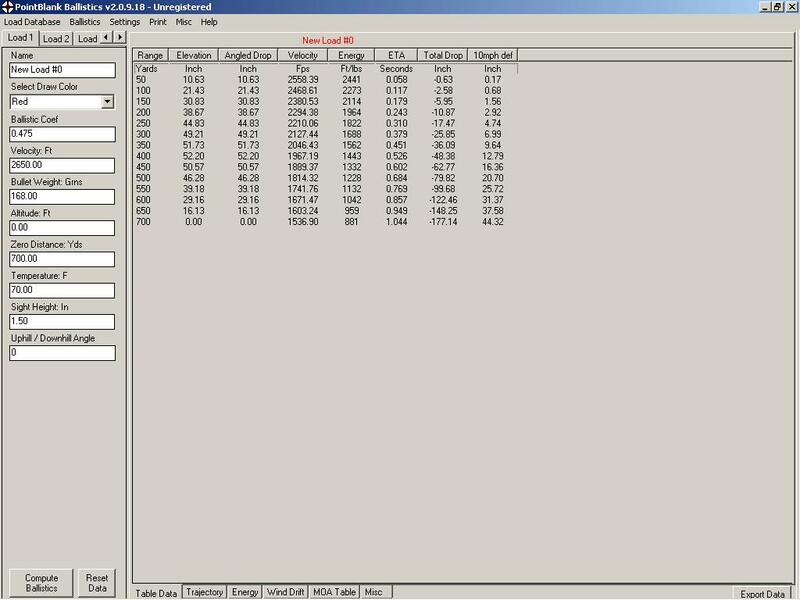 I will be looking into this as well as a couple other trajectory view issues I've had reported (those are more printing related). I think something does need to be done to scale the visual side better to keep the trajectory fully in view. My gut feeling is to scale the trajectory to fit the view and dynamically adjust the "inch" measurements on the side. I hope to work on this soon, been super busy with alot of other things lately. As I have said in one of my previous messages, please take your time. Personally I am extremely grateful for what you have already done, so the minimum I could do is to be patient and wait till you make it happen. Since you mention that you are thinking about an "auto" or "dynamic" adjustment according to the view size, may I suggest to have a look in a screen shot I took. It shows exactly what you suggest. 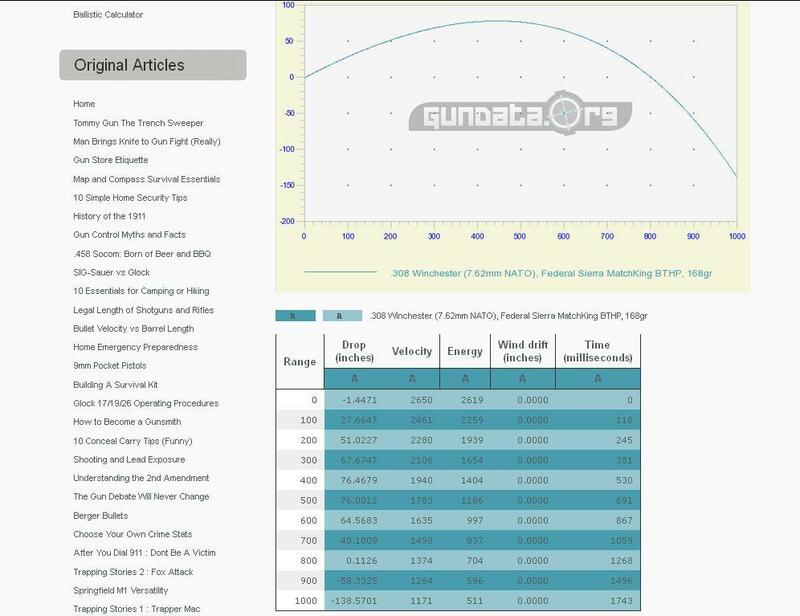 It is from www.gundata.org and in my personal opinion shows how a good looking and proportional trajectory curve should be. As I say, it is ONLY my personal opinion, and nothing more. The bullet is a .308 168gr Sierra Matchking, zeroed @ 800 yards and I asked the program to give me data calculations (energy, trajectory, velocity) for up to 1000 yds in intervals of 100 yds.